There’s no doubt about it: Credit card interest rates are going up, and these rate hikes can hurt consumers who don’t pay off their card balances every month. Rates are rising because the Federal Reserve hiked its benchmark federal funds rate earlier this year. Consumers don’t pay this rate directly, but when it goes up, market rates — the rates consumers do pay — also tend to move higher. In November, the Fed decided to hold its benchmark rate in the 2 to 2¼% range. Two years ago, the rate was near zero, a difference of 2 percentage points. Card rates are significantly higher than the federal funds rate because banks add a profit margin, known as the spread. The average card rate at the end of 2017 was about 13%, according to a July 2018 Fed study. That rate tracked the two-year Treasury, which had turned slightly and slowly upward since 2013, leaving spreads unchanged. The average doesn’t mean everyone who has a card pays 13%. In fact, the Fed study also found that average card rates for people who were charged interest were closer to 15%. And that was before this year’s rate hikes. 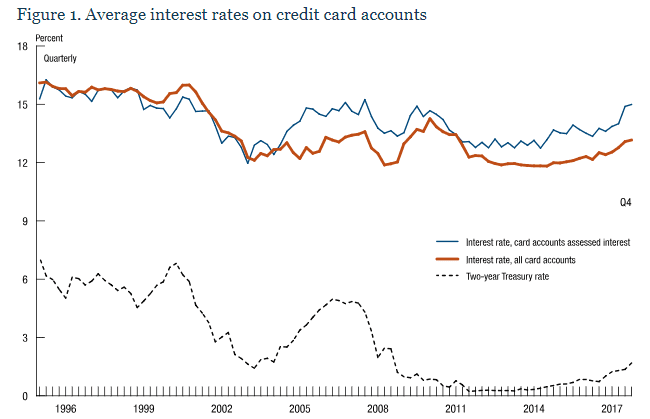 Average interest rates on credit card accounts. Source: Federal Reserve Board, Form 2835a, Quarterly Report of Credit Card Plans. How much interest you’ll pay if you carry a balance depends on your credit score, your payment history, the types of cards you have, among other factors. 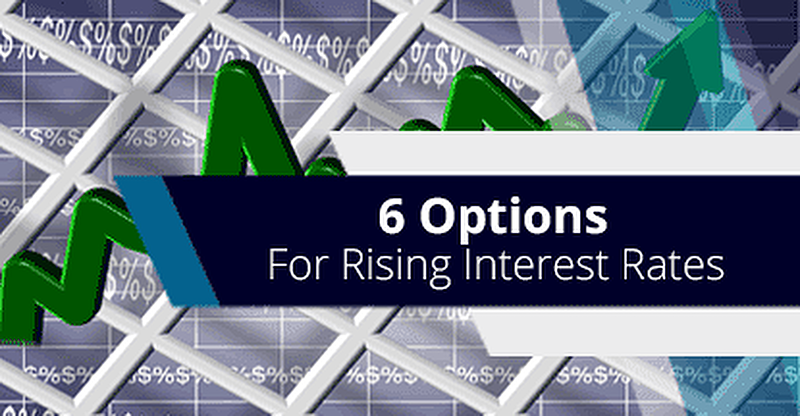 “Interest rates charged vary considerably across credit card plans and borrowers, reflecting the various features of the plans and the risk profile of the cardholders,” the Fed stated. The Fed may not be finished with its rate hikes. It’s powerful Federal Open Market Committee constantly monitors inflation, employment, and other measures of economic activity to make decisions about when to raise (or lower) the federal funds rate. There’s no one best thing you should do if your card’s interest rate rises. Rather, there are a variety of actions you could take, each with pros and cons. With most credit cards, you’ll pay zero interest if you pay your balance in full every month. In that case, it doesn’t matter whether your rate is higher or lower. You may want to shop for a new card to get better rewards or lower fees, but you won’t need to shop for a lower rate card. If you carry a balance and you can afford to pay the higher rate, you may want to just do so. Why? Maybe you carry a balance only rarely or only for a short time. Maybe your balance is low or you intend to pay it off soon. Maybe your card has low fees or a rewards program that you love. Whatever the reason, a higher rate doesn’t necessarily mean you have to dump your card. If you’ve been carrying a balance and your rate rises, that may be a good incentive to pay off your card to lower or eliminate your monthly interest expense. If you never carry a balance again, you won’t be affected by your card’s higher rate. If you normally carry a balance and are struggling to make your monthly card payment, you may want to call your card issuer and ask for a lower rate. If your card company wants to keep you as a customer, it may lower your rate as a courtesy. Ask when the lower rate expires so you can revisit your options and decide what to do next when that happens. If you have several cards and your rate rises on a card on which you carry a balance, call your card issuers and ask them about their balance transfer offers. Find out how much you can transfer, what rate you’ll be charged, and how much the transfer will cost. You can call your issuers or visit their website to see which balance transfer offers you may qualify for. Some cards offer very attractive programs to entice you to transfer an existing balance. If you carry a balance and don’t have another card with an attractive balance transfer offer, a higher rate may be an incentive to apply for a new balance transfer card. When you shop for a balance transfer card, look for a low promotional rate and balance transfer fee. 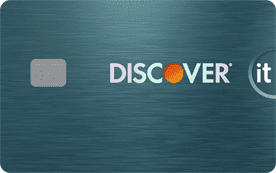 Some cards offer a 0% initial rate and no balance transfer fee. Ask how long your promotional rate will last and what your full rate will be when that rate expires. You might need to call your card issuer to transfer your balance and you should continue to make your payment until the transfer is complete. Don’t make a habit of using balance transfer cards to juggle more debt than you can afford. A better approach is to reduce your spending—radically, if necessary—until you can pay off all your card balances every month. Rising card rates can be a good incentive to review all your cards and make sure you’re happy with them. If you have a card that you don’t need, you can stick it in a drawer and not use it. If it has an annual fee, you may want to call the card issuer and cancel it. Keep in mind that canceling cards can affect your credit score. There’s no right number of credit cards that you should have. Some people manage with just a few. Others want and use dozens to maximize their rewards. Card rates are just one factor, albeit an important one, you should consider when you choose which cards you want to apply for and use most often. Marcie Geffner is an award-winning reporter, editor, and writer. Her stories about banking, credit cards, insurance, economics, small business, and other subjects have been featured by the Los Angeles Times, Washington Post, Bankrate, Credit Karma, Bookmarks Magazine, FOX Business, CNBC, Yahoo! Finance, and dozens of major U.S. newspapers. Her articles have been cited in seven nonfiction books and two U.S. Congressional hearings. She edits nonfiction, memoir, and fiction, and contributes to Kirkus Reviews. Marcie holds a bachelor’s degree in English from UCLA and MBA from Pepperdine University.